Bridges Over Time, Newburgh, New York, sold several pieces of furniture including a petrified wood table with an iron base to a design firm. In the above picture is a bronze sculpture on a Formica base by Elizabeth Strong-Cuevas, a great-granddaughter of John D. Rockefeller. The asking price was $9500. The sculpture in the rear, Red Crescent by Mary Merkel-Hess, 1998, is made of twigs and papier-mâché. The price was $6000. 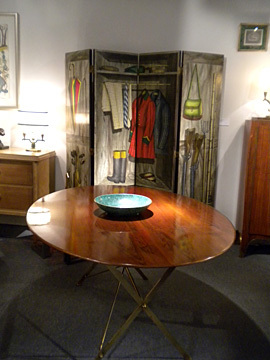 The Italian walnut oval bookmatched dining table on a brass folding base is from 1950. It is stamped in brass “Azucena.” The table is 29¾" high x 71½" wide x 51" deep. Milord Antiques, Montreal, Quebec, asked $22,500 for it. Behind the table is a 1950’s Piero Fornasetti trifold screen of an English hunting wardrobe scene. 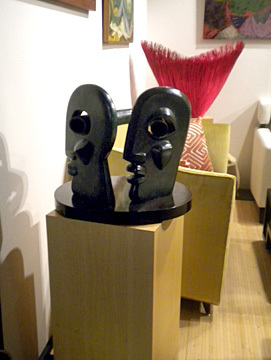 Dimensions are 78½" high x 80" wide x 1¼" deep, and it was priced at $15,500. 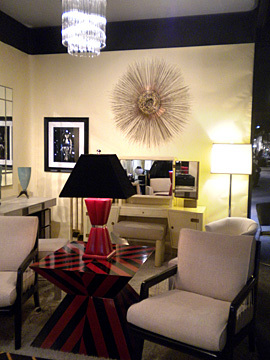 Glen Leroux Antiques, Inc., Westport, Connecticut, featured this Karl Springer red python lamp and red and black custom striped table. He asked $3400 for the 1970 lamp, which is 8" x 8" x 32" high. The 1960’s table, one of a kind with an original label, is 30" long and 23" high. He asked $19,000 for it. On the wall behind the furniture is a 1974 signed Friedle wall sculpture in bronze/brass, 48" in diameter, with an asking price of $4200. 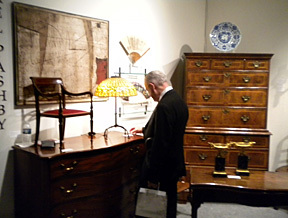 A collector at the booth of Michael Pashby Antiques, New York City. Here are some of the artists of the Devenish Group, a guild of new young artists brought together by Louise Devenish, seen on the far right. The items in their booth ranged from antiquity to present day. From left to right are Doug Weiser, Amy Zoller, Francisco Torres, Zach Zaman, Jie Xia, and Devenish. 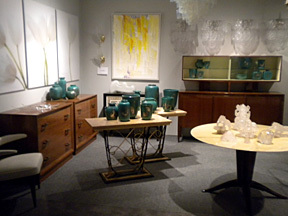 Gary Rubinstein displayed these pieces of Gustavsberg Argenta in one of his two booths. The 36 pieces were commissioned by the Swedish royal family in the 1930’s. Decorators were buying the vibrant green pieces, he said. 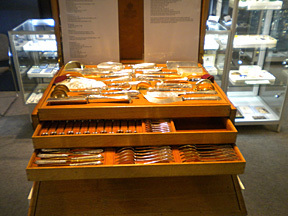 This Fabergé silver flatware service for 24 was prominently displayed by John Atzbach of Redmond, Washington, a dealer of Imperial Russian antiques. He asked $195,000 for it. 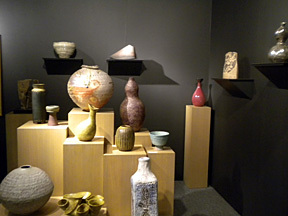 Dai Ichi Arts, Ltd., New York City, displayed limited edition and one-of-a-kind jewelry, as well as this mixture of Japanese, Scandinavian, American, French, and Italian ceramics. The pieces are from the mid-20th century and include more current designs as well. They range in price from $2500 to $8800. Beatrice Lei Chang of Dai Ichi shared the booth with Sally Rosen of nexxt20, Dallas, who featured artist jewelry. 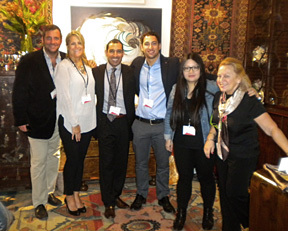 New York was sold on opening night at the 2013 Avenue Shows’ Antiques, Art & Design at the Armory. And so was the show. High-society, high-heeled patrons, more than 1000 strong, descended upon the Park Avenue Armory in New York City to be seen, heard, and photographed at the opening preview of this “shopping event,” the first show of the fall season, held October 10-13. By Saturday, dealers were notified that the show had been bought by the Palm Beach Show Group (PBSG) when they were asked to sign contracts for next year’s show with the group’s “signature” pen. New York, 1940, a tempera and oil painting by Thomas M. Dietrich, was sold by Bernard Goldberg Fine Arts. Other first-night sales included sconces, sculpture, modern and contemporary works on paper, and furniture, according to Barbara Goodwin, director of the show. “It’s important to have a mix,” she explained, “to keep the show lively and to refresh the audience. There’s something for everyone,” Goodwin stated, explaining that the most important criterion is quality. Several dealers would have liked to see more of those types of collectors attend the show. Some did well, most did all right, but others didn’t do well at all. One New York City art dealer said he would have sold the same things at his nearby gallery, while a silver dealer said holding the show on Columbus Day weekend was a mistake. That will change next year. The new owners will hold the show in September, and it will be called The New York Art, Antique & Jewelry Show. The design affiliation, which was added to the Avenue show in 2011, will be excluded from the name for now, said Scott Diament, president and chief executive officer of PBSG. PBSG is known for its aggressive marketing. It currently runs nine other shows in Dallas, Los Angeles, Baltimore, Chicago, and Naples and Palm Beach, Florida (see sidebar). Of 68 exhibitors, more than 20% offered jewelry. “It’s a strong category for us,” said Goodwin. Illustrating the eclectic nature of the show, one could find a $250 Alex & Lee bracelet from Oliver & Espig, Santa Barbara, California, and a 10.06 carat natural fancy blue diamond, nicknamed the “Royal Blue,” from M.S. Rau Antiques, New Orleans, for $9.5 million. Both dealers did well. At close of show on Sunday, the Alex & Lee case was noticeably bare, while Rau reported he’d turned down a “substantial offer” from an American buyer for the Royal Blue. Holden Luntz Gallery, Palm Beach, Florida, sold Girls in the Window, NYC, 1960, an Ormond Gigli photograph, and had “lots of interest” in an Albert Watson black-and-white photograph of model Kate Moss, said Jodi Luntz. This was the second year at the show for Holden Luntz, and the booth, which last year had a “wonderful show,” drew lots of attention. Imperial Fine Books, New York City, sold a three-volume first edition of The History of New York by W.L. Stone. The asking price was $3500. An “Eclipse” patent oak floor-standing games table generated a lot of buzz opening night at M.S. Rau’s booth and was gone from the booth the next day. The asking price was $24,500. Waterhouse & Dodd, New York City and London, sold three “little things” opening night and had interest in Calder, Avery, and Wesselmann and a reserve on a Wyeth drawing, said Ray Waterhouse. He reported a few days after the show that he’d had seven sales and made a profit. Daphne Alazraki Fine Art, New York City, sold a Dutch 19th-century painting by J.F. Spohler. FraMont, Greenwich, Connecticut, together with Kendall Fine Art, Atlanta, sold three Cubist paintings. Brenner Valdez Antiques, Tampa, Florida, sold a 6' long Regency sideboard to an established customer and a pair of 6' high bamboo mirrors to a well-known designer couple. The mirrors came out of a house in Palm Beach, as did a French landscape from the 1940’s that sold for $3800. The show’s design committee was cochaired by noted designers Ellie Cullman and Mario Buatta. The New York School of Interior Design ran a whole day of design presentations by Vicente Wolf, Sandra Nunnerley, Benjamin Noriega-Ortiz, and Geoffrey Bradfield. There were many book signings, including those by Susanna Salk, Paul Doros, Karen Lehrman Bloch, and John B. Murray. Gary Rubinstein Antiques, Miami and West Palm Beach, Florida, spread out into two booths. One booth featured Art Deco mahogany and silvered bronze chairs by Jean Pascaud and a pair of Edgar Brandt demilune console tables. The other booth was filled with 36 pieces of signed Gustavsberg Argenta pottery that had been commissioned by the Swedish royal family in the 1930’s. Pieces were sold individually, but Rubinstein said decorators were buying several of the deep green pieces at a time. Things were busy at Moylan-Smelkinson/The Spare Room throughout the show. The Baltimore-based dealers sold a lot of ceramics in hard-to-find patterns, and their cases of Georgian and Victorian jewelry were consistently busy. Trends in jewelry were colored stones, platinum, and double-clip brooches, noted several jewelry dealers. For more information, see (www.palmbeachshowgroup.com) or (www.nyfallshow.com). “Their marketing capabilities are second to none,” proclaimed one fine arts dealer, who exhibits at other PBSG shows around the country. Diament said owning the New York show, which ran under the “Avenue” aegis for seven years and prior to that was run by Wendy Shows, completes his branding format. Next year’s show, to be held September 17-21, “will have white carpet, flowers, and champagne,” he said in a telephone interview. The company, headquartered in Palm Beach, has 24 full-time employees and manages shows in Los Angeles, Chicago, Dallas, Baltimore, and Naples and Palm Beach, Florida. It also owns CollectorsNet.com, an on-line marketplace where dealers can display their inventory for an annual fee. “We’ve compiled an enormous mailing list of northeast collectors,” said the PBSG head, who runs the company with vice president Rob Samuels. “One of the best things about buying the Avenue show is that Barbara Goodwin will now work with the whole PBSG team. She will spearhead the New York endeavor,” Diament reported. “Over 150 [dealer] applications came in yesterday,” he announced. “There’s tremendous demand.” Next year’s show “will have a number of current participants,” as well. Although “Design” will be eliminated from the name of the show for now, Diament said the 2014 show will have Scott Snyder, who is well known in the design community. In addition, he announced that Hope for Depression Research Foundation (HDRF), founded by Audrey Gruss, will be the show’s beneficiary. He also announced that Avenue will be the media partner for the 2014 show.